1. Most operators have similar prices for tours. Low price is a sign of problems in the company, which will necessarily affect the quality of the tour. Large and serious companies always have both small buses for 15 people and big buses for groups of 35 people. The guides are certified and give tours using the latest audio equipment. 2. Language. There are operators who give tours speaking only your language. There are those who give tours simultaneously in several languages. In such case, it is likely that you will hear the information, which is spoken in your native language, only when you have already passed by the sight. «Hop-on Hop-off» buses with an audio guide in your language belong to a separate type of tours. The route is made up of many consecutive stops where you can get off, walk as long as you want and then return to the stopping point and continue the tour on the next bus of the company. 3. Be sure to ask for the tour route. Perhaps on the way to the destination you will also be taken to a brewery, castle or fortress, to the crystal factory or to an outlet. 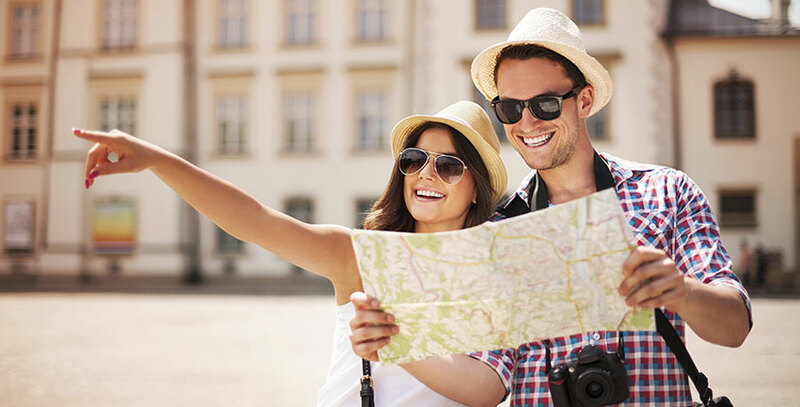 If you learn the detailed information in advance, then you will avoid any unpleasant surprises during your travel. 4. All the tourist routes necessarily include sightseeing, entrance fees shall be paid separately. 5. Before you pay for a tour, make sure you are satisfied with the conditions of the cancellation or refund. Czech cuisine is high-caloric and primarily famous for its meat dishes. Baked pork knee (pečené vepřové koleno), hot-pot with the tenderest beef sirloin called “svichkova” (svíčková), beefy goulash soup in bread (gulášová polévka v chlebu), tataric steak made of raw meat with garlic croutons (tatarský biftek) - all of this shall be abundantly washed down with delicious barmy beer. For a titbit, you will be traditionally served fried breaded cheese called “hermelin” (smažený hermelin) with sweet cranberry sauce or beery olomouc cheese (pivní olomoucký syreček). Sopska salad (šopský salát) is very popular too, it is an easy combination of cucumbers, ripe tomatoes, green salad with a special sauce and slices of cheese. 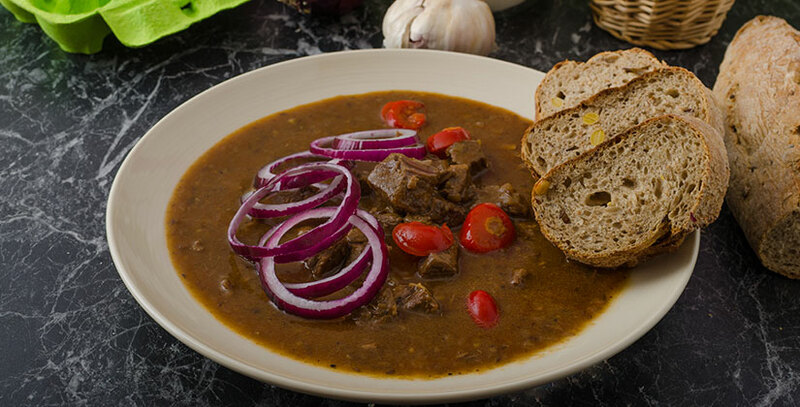 Among the soups we would reccomend goulash soup, onion suop, garlic soup (gulášová polévka, cibulačka, česnečka). The most delicious foods among the side dishes in Czech cuisine are boiled potatoes, stewed cabbage and, of course, dumplings (knedlíky)! Dumplings have round shape and they are cooked of boiled dough, being almost the most important dish of Czech cuisine. We also suggest you to visit a good Czech restaurant and to order the Czech "wedding" dish there, it is called “svichkova in cream” (svíčková na smetaně), tender beef with vegetables, whipped cream and cranberry jam. A glass of white Czech wine will perfectly match with this dish. 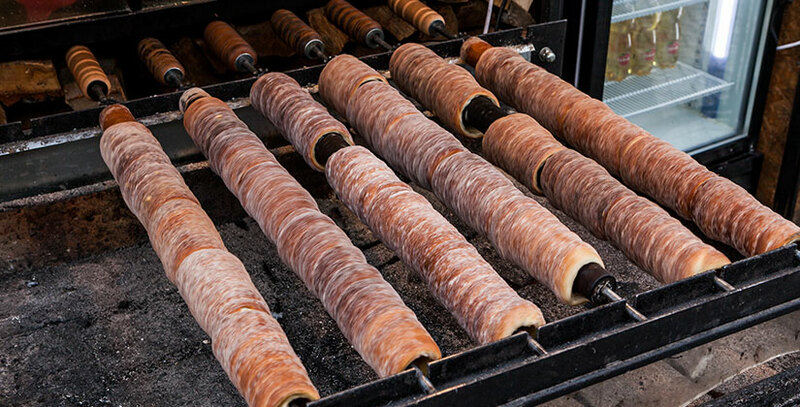 And among the desserts we would recommend the famous pancakes, strudel, sweet dumplings and trdelnik. Yum yum! The capital also has the world famous fast food chain restaurants: McDonald's, KFC, Burger King, SubWay, Nordsee, Boulevard, Paul and others. If you want an easy meal or something being cooked fast and all the nearby restaurants are closed or overcrowded, then visiting a fast food spot is the right decision. You can visit local restaurants and fast food in the morning to have a breakfast. Nowadays, the menus of almost all the fast food restaurants include salads, yoghurts, fresh juices, fruits and herbal teas. Even the most demanding guests of the capital will be able to find some food they like. But please don’t go to the restaurants located right in front of the hotel. If you have enough time, the firstly you shall walk through the city and enjoy all of its features. On your way you can see a lot of unusual things. In Prague you will enjoy the small street cafes with different kinds of pizza and “khlebichki” (chlebíčky) - Czech sandwiches the size of an average size matchbox, which have been famous since the Soviet times! Khlebichki is a living proof of the fact that it is really tasty to eat sandwiches with meat located on their downside. Czechs add very hearty and tasty fillings to them! Foreigners call them "Czech sandwiches", you can be find them in cafeterias called Lahůdky. In the center of Prague near metro stations you can always find trays of grilled Bavarian sausages seasoned with ketchup, mustard and pickled cucumbers. A cup of good coffee is a great thing to start a day with, it is a guarantee of good mood and a real sacred ritual! In Czech Republic as in other European countries you can find the world-famous Starbucks, Costa Coffe and t McCafe, but we recommend you to visit the local "kavarnas", that’s how the coffee shops are called in the Czech. How can we check if a "kavarna" offers qualitative coffee? Firstly, the places with really good coffee always have a lot of visitors. Let’s suppose that you found a coffee shop, which is literally always full of visitors. Come inside, look whether it meets to your requirements in terms of comfort and design. Rich assortment, smiling staff, fresh pastries, sterile cleanliness and internet access - this list is not complete at all, but using it you can easily recognize a good coffee shop. You can find both trendy coffee shops built in the urban style and comfortable homelike coffee shops in Prague. In many of such place you can not only drink coffee, but also buy a nice, useful gift in the form of a mug with the symbols of Prague, French-press or unique variety of coffee, which was roasted in a coffee shop. The world-famous company called «Tchibo» demonstrates an interesting and unconventional approach to the creation of stores, also everyone in Russia knows this coffee brand. «Tchibo» coffee shops are located mainly in shopping centers. 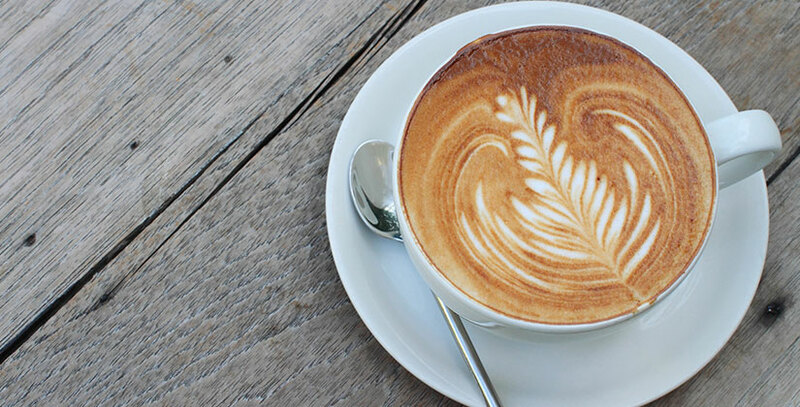 You can not only enjoy a cup of cappuccino or latte here, but also you can buy a sweet, offbeat trifle for home or some inexpensive, but high-quality clothes and even jewelry. Clothes are being produced in limited editions. The collection is being completely renewed a couple of times a month. But most importantly you shall remember that the basis of every kind of coffee is the espresso, the taste of which directly depends on the quality of the coffee beans, on the way they are roasted and directly on the machine. An indicator of the quality of a good espresso is a delicate white skin on the top and rich earthy taste. Shoppers from around the world regularly come to Prague for the excellent shopping. 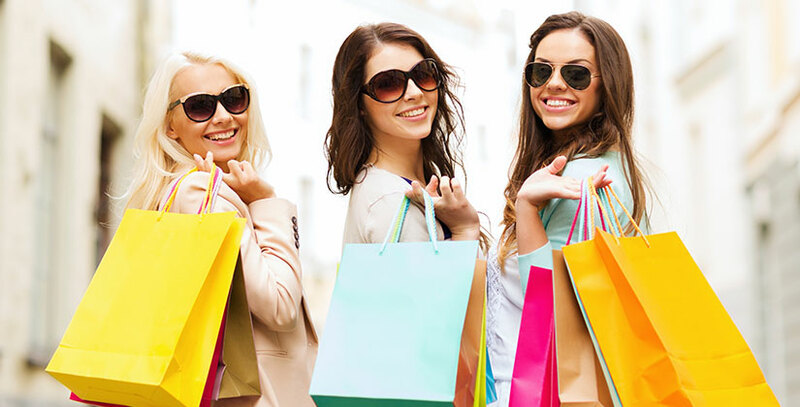 Modern shopping malls, many shops of quality clothing, a wide range of goods, low prices and a special atmosphere make shopping in Prague being particularly attractive. Boutiques of such prestigious brands like Cristian Dior, Valentino, Roberto Cavalli, Louis Vuitton, Hermés, Lacoste, Alfred Dunhill, Salvatore Ferragamo, Prada, Miu Miu, Burberry, Hugo Boss and many others are located on Paris street (Pařížská ulice) next to Staromestke square (Staroměstské náměstí). Shops with affordable brands: Zara, H&M, New Yorker, Promod, Bershka, Reserved, Adidas, Tommy Hilfiger and many others are located on Prshikope (Na Příkopě) street and in large shopping centers. If you are a true lover of shopping, then you shall not miss the seasonal sales. During this period the discounts go up to 70%. Seasonal discounts in Prague stores start: in mid-December, at the end of April, in the beginning of July and in the beginning of October. Look for signs with the word SLEVA or SALE. Prague, like many major European cities is famous for loose morals. Young people from different parts of Europe come to the ancient capital to fully feel all the joys of nightlife. After the nightfall the respectable Czech capital reveals a very different side. Most nightclubs are located in the city center, which is very convenient. 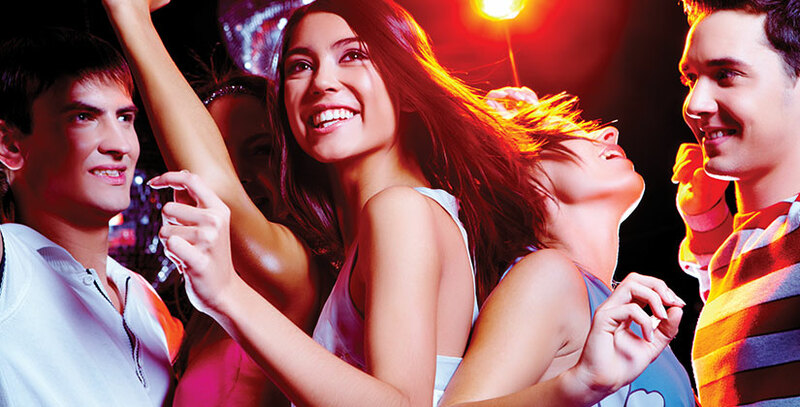 All of them are trying to attract visitors with original interior, informal atmosphere and interesting club life. Rock, disco, jazz festivals, strip shows, theater – it is not even a complete list of what the today's night clubs of Prague can offer. Every year the number of clubs is growing and it is not surprising, because the night life here is much cheaper than in other European cities, but the most fashionable artists from around the world come here and delicious cocktails are being poured the at local nightclubs, beautiful girls and boys are dancing until the early hours. It is simply impossible to resist! You can get free information about upcoming events in any club, you only need to take their brochures at the entrance to the club. Shopping, sightseeing and trips to restaurants are so exhausting! At the end of almost a “work” day on holiday we like to relax mentally and physically. Spas and beauty salons will help to recuperate after long walks around the city. Currently there are hundreds of luxury saloons in Prague equipped with the most modern equipment. Professional beauticians work in each of these salons. Massages, facial masks and body wraps are very popular among all kinds of cosmetic procedures. 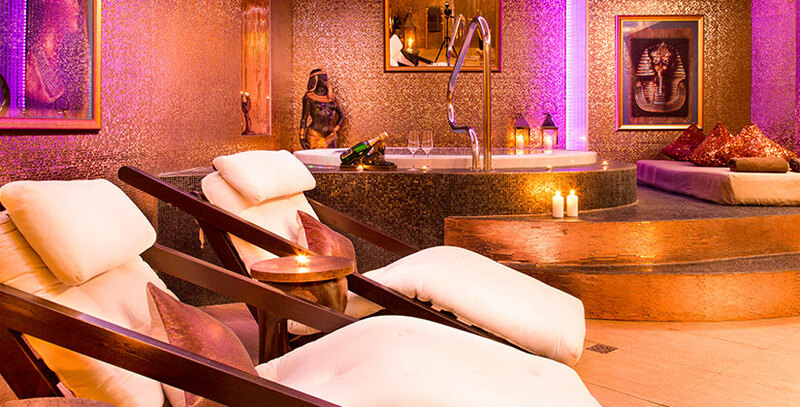 SPA salons are particularly in demand in recent years, there you can soak in a hot tub, warm up in a sauna and, if you have time and desire, you can enjoy a massage or body wrap. SPA has all the conditions for full relaxation: relaxing music, sweet smells, delicious herbal teas and soft light. We recommend to visit Royal Court SPA, which is located in the center of Prague on 6 Wenzigova St. You will certainly appreciate its cozy and romantic atmosphere. Prague Zoo (Zoologická zahrada) is the largest zoo of the Czech Republic and one of the largest in Europe, it is located in Troy basin. There are both open and closed pavilions in the zoo. In closed pavilions you can find panthers, tigers and other predators as well as monkeys, giraffes, birds and insects. The most extensive unique pavilion standing out among the other pavilions of the zoo is called "Indonesian jungle", it was opened in 2002 and it recreates the atmosphere of the tropical jungle. The pavilion is a two-storey ellipse glass structure, inside of it you can find planted tropical plants, there is also a terrace to observe the life of gibbons, orangutans, Komodo monitors and other tropical animals. There is located the only one Pavilion in the Central and Western Europe, which is home to the giant Galapagos tortoises: only the Prague zoo managed to create a suitable habitat for them. They coexist with Galápagos tortoises from the Seychelles, they the largest tortoises in the world. Rare animals are being preserved in the zoo, including the Przewalski horses, giant turtles, endangered species of lizards, gavials, cat families, antelopes and more. There are 169 species of mammals, 270 species of birds, 120 species of reptiles, 10 species of amphibians, 60 fish species, 1 specie of cartilaginous fish, 31 species of invertebrates in the zoo. Among them, 471 species are in the IUCN list and 14 species are endangered. In addition to the fauna, the zoo has 300 species of rare plants including trees. Among the famous zoo animals we should mention the long-liver – an elephant named Gulab, this elephant celebrated the anniversary of 40 years in the zoo on July 4, 2006. 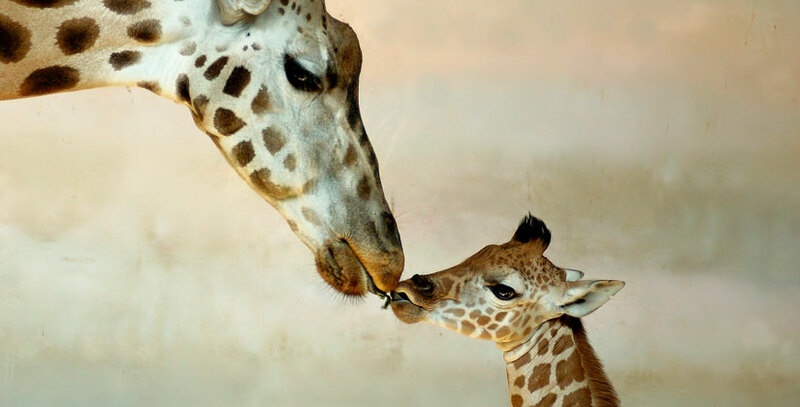 In 2009, 959 animals were born in the zoo. There are playgrounds, small restaurants, souvenir shops and working chairlift in the zoo. Ducks are walking inside the beer restaurant. Children and their parents can cover long distances on a special trolley wagon. Along the way you will meet a lot of machines with coffee, soft drinks and chocolates. People sell hot dogs and ice cream literally on every corner. At the end of the tour you can have a tasty lunch in the Oceán restaurant. Prague is the perfect place for family recreation! For example, there is a small but very interesting Lego Museum (Praha, Národní 31, Národní Třída) in the city center, which has exhibitions with the very first Lego sets and models from the latest collections. We highly recommended to visit the exhibition called “The Kingdom of railways” (Praha, Stroupežnického 23), which is located a few steps from the Andel metro station. The kingdom has exhibitions with more than one hundred working models of railways. Continuing the theme of railways, we suggest you to dine in the «Výtopna» (Praha, Václavské nám. 56) restaurant, which is located on the Wenceslas Square, here you will feel like the passenger of a comfortable train and retro caravans will bring soft drinks and desserts plying the rails of a little railway getting through the entire restaurant. Stromovka covers an area of about 95 hectares. There are green fields and beautiful manicured trees in the park as well as ponds with ducks and children's playgrounds. Riegrovy gardens spreaded in the picturesque hills having beautiful views on Hradcany and Petrin Hill. Vojanovy park is one of the oldest parks of Prague hiding in the Malá Strana behind a small romantic arch roof. Peacocks are wandering in the park among fruit trees. Here you can escape the city and enjoy peace. Letenské park is probably the most sunny park. The name of the park originates from the ancient word "Leten", which was used to name a "well-lighted place". Locals often call this park the lungs of Prague, because it is located on a sufficiently large area of 25 hectares in the vicinity of the city center. Breathtaking views of the gallery Prague bridges from the observation deck of Letenské park won’t leave anyone unimpressed.